The NSE Nifty closed with a gain of 138 points at 7,735. The NSE Nifty opened at 7,651 hitting a high of 7,739 and low of 7,643. The benchmark BSE Sensex regained the 25,000-mark on the back of a rally in realty, metal, banking and capital goods sector stocks amid a firming trend overseas. The BSE Midcap and Smallcap indices closed 1.8% higher each. ICICI Bank, Tata Steel, Lupin, Tata Motors, Adani Ports, PNB and Vedanta were among the gainers on NSE, whereas Zeel, M&M, HDFC, Bharti Airtel, Maruti Suzuki and HUL were among the losers today. On the global front, China’s Shanghai Composite Index closed up by 2.68% and Hang Seng ended marginally up 2.10%. In Europe, the FTSE 100 marginally up 1.5%. On the other hand, DAX and the CAC 40 trading higher by 1.5% each. The Indian Rupee was trading up by 15 paise at 66.39 per US dollar. The India VIX (Volatility) index was up 4.70% to 16.8075. Out of 1,799 stocks traded on the NSE, 345 declined and 1,212 advanced today. A total of 31 stock registered a fresh 52-week high in trades today, while 37 stocks touched a new 52-week low on the NSE. At 2:49 PM, the S&P BSE Sensex is trading at 25,333 up 423 points, while NSE Nifty is trading at 7,735 up 138 points. 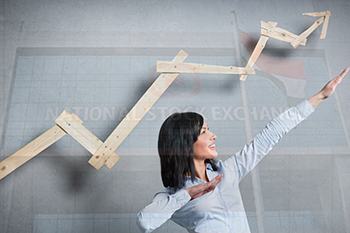 The BSE Mid-cap Index is trading up 1.79% at 10,537, whereas BSE Small-cap Index is trading up 1.82% at 10,488. Tata Steel, Lupin, ICICI Bank, GAIL, Adani Ports, Bajaj-Auto, Tata Motors and SBI are among the gainers, whereas HDFC, M&M, Maruti Suzuki and Bharti Airtel are losing sheen on BSE. Some buying activity is seen in metal, realty, industrial, pharma, auto, capital goods, basic materials and banking sectors. The INDIA VIX is down 3.77% at 16.9725. Out of 1,795 stocks traded on the NSE, 275 declined, 1,246 advanced and 274 remained unchanged today. A total of 20 stocks registered a fresh 52-week high in trades today, while 27 stocks touched a new 52-week low on the NSE. Adani Transmission was up 4% at Rs. 34. The company is planning to raise Rs 3,000 crore or more via masala bonds, says report. The company has appointed four bankers, including Barclays, Bank of America Merrill Lynch, Bank of Tokyo-Mitsubishi and Standard Chartered, to market the proposed fund raising in Singapore, London, New York and some parts of Europe, as per reports. Shares of Tiles companies rallies on BSE after the imposition of anti-dumping duty on vitrified tiles.Today, the government has imposed USD 1.37 per square metre anti-dumping duty on all vitrified tiles from China, which is far lower than industry expectations, as per media reports. Industry has expected anti-dumping duty at USD 3 per square metre. Anti-dumping duty imposed on vitrified tiles is for next six months, according to the reports. Aro Granite Industries gained 2.4% to Rs.42.Orient Bell jumped 2.5% to Rs.137. Nitco soared 10% to Rs.41. Murudeshwar Ceramics climbed 5.9% to Rs.20.80. Madhav Marbles & Granites soared 4.2% to Rs.42.50. Kajaria Ceramic trading flat 0.2% at Rs.945.70. HSIL gained 2.7% to Rs.280.Euro Ceramics jumped 6% to Rs.3.05.Cera Sanitaryware trading lower by 0.3% to Rs.1826. Finolex Cables climbed 8.5% at Rs. 287. The company experienced a spurt in volumes by more than 13.65 times. The stock is trading on a 52-week high on BSE. Glenmark Pharmaceuticals slipped 1.7% to Rs.768.10 on BSE. Glenmark has been granted final approval by the United States Food & Drug Administration (USFDA) for Drospirenone and Ethinyl Estradiol Tablets USP, 3 mg/0.03 mg, the generic version of Yasmin Tablets of Bayer HealthCare Pharmaceuticals Inc.
Rallis India jumped 2.3% to Rs.173.75 on BSE. Ikea is buying the lease rights of a 26-acre plot on the outskirts of Mumbai from Tata Group company Rallis India for about Rs. 214 crore, reports a national daily. The site at the MIDC Industrial Estate at Turbhe on Thane-Belapur road in Navi Mumbai could also house a back-end unit for the Swedish furniture retailer, says the paper. Piramal Enterprise was higher by 7% at Rs. 1043. Piramal Enterprises Limited through its structured investment group and Dutch pension fund asset manager APG Asset Management will invest USD 132 million to power Essel Infrastructure’s Solar IPP platform across India. Zee Entertainment Enterprises Ltd has informed BSE that the Board of Directors of the Company at its meeting held on March 29, 2016, inter alia, have approved in-principle the proposal for re-organising Advertisement Sales and Channel Distribution functions in the Business operations of the Company. Zee Entertainment Enterprises Ltd is currently trading at Rs. 376.65, down by Rs. 4.85 or 1.27% from its previous closing of Rs. 381.5 on the BSE. Andhra Bank has allotted 2,88,53,210 equity shares of Rs. 10 each to Life Insurance Corporation of India on preferential basis at Rs. 47.30 paise per equity share, including a premium of Rs.37.30 paise per share. Andhra Bank is currently trading at Rs. 50.55, up by Rs. 0.6 or 1.2% from its previous closing of Rs. 49.95 on the BSE. Tata Steel was up 1% at Rs. 306. The board reviewed the recent performance of the European business of the company, more specifically of Tata Steel UK. BEL gained 1.5% to Rs.1,198 on BSE. Thales and BEL-Thales Systems Limited, the joint venture between BEL and Thales, have signed a partnership agreement for joint development of PHAROS fire control radar during the ongoing Def Expo in Goa, as per media reports.The joint development will strengthen the co-operation of Thales and BTSL in the field of innovative technologies, as per reports. Future Consumer Enterprise rallied 5.5% to Rs.21.05 on BSE. Around 1.7 crore shares were traded in a single block at Rs. 20.20 on the BSE. Hotel Leelaventure gained 2.3% to Rs.17.80 on BSE. Around 23 lakh shares were traded in a single block on the BSE. Unity Infraprojects Ltd stock was up by 4% at Rs. 12. The company has announced that the Lenders of the Company in its Joint Lenders Forum (JLF) held on March 29, 2016 have approved in "In principle" the decision for invocation of Strategic Debt Restructuring (SDR) pursuant to RBI Circular dated June 08, 2015. Lupin Ltd stock was up by 3% at Rs. 1437.Yesterday, the stock was lower by 12%. Lupin has clarified that there is speculation about a US FDA audit at Mandideep facilities. The Suzlon Group, one of the leading global renewable energy solutions providers in the world, announced another turnkey order of 48.30MW wind power project from Indian Oil Corporation Limited (IOCL). Suzlon Energy Ltd is currently trading at Rs. 13.39, up by Rs. 0.52 or 4.04% from its previous closing of Rs. 12.87 on the BSE. Shree Cement has commissioned Autoclaved Aerated Concrete (AAC) Blocks Project having capacity of 3 Lac Cubic Meter Per Annum at Sikandrabad, Bulandshahr in Uttar Pradesh on March 29, 2016.